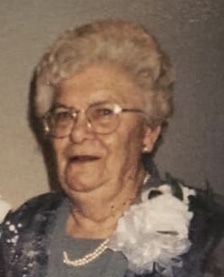 Shirley L. Hurley, loving wife, mother, grandmother, and great-grandmother passed away Tuesday, March 26, 2019, at the age of 90. She passed away at Nanticoke Memorial Hospital, surrounded by her family. Shirley was born on July 17, 1928, in Cambridge, Maryland, to Roland and Carrie Saunders. She worked as a dedicated home health aide as well as a nurse’s aide at the Seaford Manor House for many years. On March 25, 1949, Shirley married Edgar Thomas Hurley, Sr. They raised five children, Ed Jr., Bill, Connie, Greg, and Mark. Shirley and Edgar Sr. were proud to be founding members of Christ Evangelistic Church in Laurel. Shirley took pleasure in spending time with her family. She also liked going out to eat, and she combined these two hobbies by having her family take her out to eat, usually to the Dairy Bar or Pizza King, or PK’s as she would say. Shirley always looked forward to the family reunion in July and the Christmas dinner in December. Whether the family reunion was at Cherry Beach or in Denise’s back yard, she always made sure everyone wrote their name in the notebook. Shirley could always be found at her grandchildren’s sporting events or at the kitchen table ready to play card games. She was known and will forever be remembered for her kind heart, willingness to help others, and always having candy in her purse for the kids. Shirley was preceded in death by her parents, Roland and Carrie Saunders, her husband, Edgar Thomas Hurley Sr., her sister, Emily Rhodes, her brothers, John and Warren Saunders, her son, Mark Hurley, her daughter-in-law, Judy Hurley, and her son-in-law, Ron Lawrance. She is survived by her four children, Ed Hurley Jr., Bill Hurley (Nancy), Connie Lawrance, and Greg Hurley (Betty), her daughter-in-law, Robin Hurley, her eight grandchildren, Cindy VanVorst (Mark), John Greene (Gina), Denise Crocket (Scott), Adrienne Nickerson, Kristie Hurley, Amber Cohee (Matt), Kyle Hurley, and Todd Hurley, ten great-grandchildren and several nieces and nephews. Funeral Services will be on Friday, March 29th at 2 PM at Christ Evangelistic Church, 9802 Camp Rd, Laurel, DE where friends may call from 1 to 2. Burial will be in Blades Cemetery.